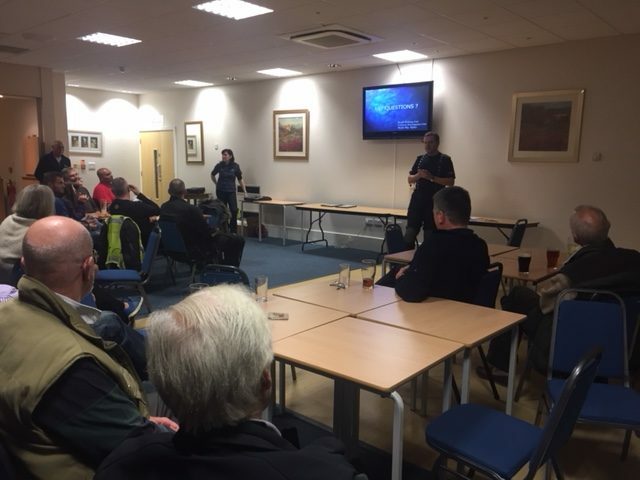 Thank you to everyone who attended our Club Night on Monday. As always it was great to see so many familiar faces. 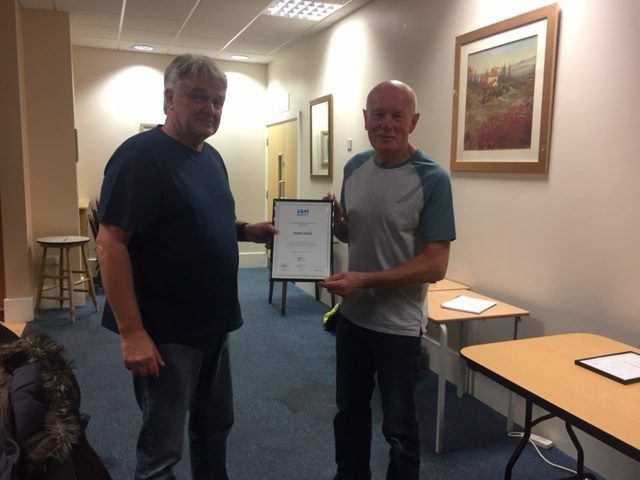 I was delighted to hand over to an Observer, Dave Bettison to present a Certificate to Terry Page who recently passed his Advanced Test. Many congratulations to you both on an excellent result! If you haven’t received an email from the IAM yet – you will soon receive an email to renew your Membership as a Fellow. Please do take up this opportunity, whilst it’s slightly more expensive, it gives you the added benefit of a free re-test every 3 years. If this isn’t enough incentive, there are additional enhanced benefits. For further information, click here. At the Meeting it was announced that we require a new Rideout Coordinator. I am delighted to now advise you that we are currently liaising with a new Coordinator who will be taking over the role shortly. The Rideout Coordinator’s role is a pivotal as ultimately, you’re all in the club to attend Group Rides and enjoy the company of your fellow bikers. I’d love to introduce you now to our new Coordinator, however, there are a range of discussions which need to take place prior to introducing you all. Please watch this space. I’m pleased to advise that this ride will now proceed as previously notified. HOWEVER, the ride to meet Peter will be unofficial and not bound by our club rules/regulations etc. Two Members have stepped forward to say they will lead the ride up to meet Peter. This means that anyone without knowledge of the area can ride safely in the group without having to worry about getting lost! The plan is for riders to meet at 8.30am at Ripley McDonalds. Andrew Jones and Paul Davies will then ride with you to Ferrybridge Services near the A1M/M62. Peter Serhatlic will then lead a loop ride towards Scarborough. 4 members of the Nottingham group meet everyone at Ferrybridge. 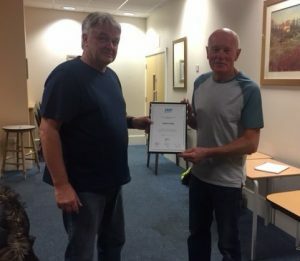 Paul and Andrew – thank you for bravely volunteering to assist! Ride to Donner Nook. We’re waiting on the dates of this ride to be published, when we have details we’ll let you know. As usual we’re looking to get together in the New Year. You’ll have another opportunity to eat, drink and enjoy more mince pies. We will send out menus shortly together with a date. Paul explained their various roles and why their positions were important. He then outlined what types of evidence they collected to ascertain the cause of the incident. It was fascinating to learn how the roles interacted. It was also interesting good to hear initiatives the Police are working on. 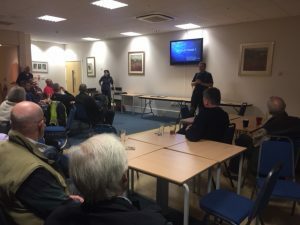 Paul spoke about Operation Safe Ride which is conducted on 8 High Risk Routes in the Derbyshire area. This initiative promotes road safety and covers not only irresponsible behaviour but also helmet legality, visors and machine conditions. What was really heartening to hear was the fact that road casualties related to motorcyclists was in fact coming down, lets hope it continues! I look forward to seeing you all again at our next club night on Monday 13th November.